The Rock Climbing Wall is as fun as it is challenging. There are 4 levels of difficulty to meet everyone's adventurous spirit. Our Rock Wall is auto belay, so we can concentrate on helping and encouraging the climbers all the way up. Our event staff is trained to coach the climbers and encourage them as they strive for the top of the Rock Wall. We really enjoy seeing the joy and satisfaction that every party attendee walks away with after climbing our 25ft tall Rock Climbing Wall. At Solid Rock Sports, we've found that the Rock Wall brings out some great family moments. We've seen glowing pride from parents, surprised cheers from event onlookers, and self-esteem boosts in everyone that tries. The Rock Climbing Wall has become much more than just a party rental. Our Rock Wall is challenging for all levels of climbers. Just like the 5 station wall, this 4 station climbing wall is 25' tall and is equipped with an auto belay system. Colored hand holds are great for coaching climbers. This wall can be rented with or without the built in 3 station bungee trampoline. All Rock Climbing Wall rentals include a minimum one Fun Makers staff person. Generally we have 2-3 climbers at a time on the Rock Wall, and we always have a huge line. Don’t worry though, our staff is well trained and manages the Rock Wall as efficiently as possible. You’ll notice that whenever possible we will have climbers in a rock wall harness and in queue waiting for the difficulty level that is right for them. We want everyone to enjoy themselves on the Rock Climbing Wall, so we will do our best to give them a few opportunities and even switch them to a different difficulty level without prolonging the wait in the line. 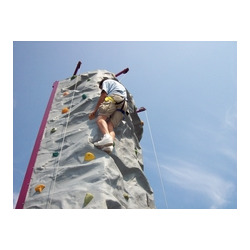 Rock Climbing Wall rentals are available throughout Oho, PA and MI.